He describes the Leed-certified, Teachers Village in Newark and how it is has been a catalyst for growth in downtown Newark, New Jersey. Being the first residential development in Newark in decades, it required a public-private partnership. It wasn’t an easy task as there were 25 separate approvals for this $150M project. The core of the vision is centered on teachers and helping them day-to-day with excellent living conditions and long-term with life-long learning opportunities. Clustering of these like-minded folks has developed a buzz of innovation around education and includes participation and programming from the RBH Group and local universities . Echoing what was said by others at the Forum, this sort of project is regional in nature that includes not only the schools that are in the Teachers Village, but schools further afield. The net result is that Vehicle Miles Traveled have been reduced (Beit indicated off-camera that the parking is 0.3 spaces per unit) and this project has been a vehicle for recruiting teachers, as he mentions above. As a former board education member, City of San Jose council member and current county supervisor, Dave Cortese provides insightful background on school entitlements, affordability/income challenges and the County’s $950M bond fund for housing. A theme of his comments is that it is important for different agencies and entities to work together to leverage funds and assets to maximize the benefit of given projects. He also brings up the tricky path of creating workforce housing without violating Fair Housing Laws. He also suggests that agencies need to consider all options, including the creation of investment pools with housing vouchers as a potential solution. Michael Brilliot of the City of San Jose Planning Department suggests that the Teachers Village in New Jersey is the perfect kind of project for San Jose’s Urban Village approach to growth. He also mentions a similar concept proposed in the Alum Rock Urban Village, which would include a school and 94 affordable units of housing (see links below). He suggests that recent rules enacted by the Council allows affordable housing to be put in an urban village at any time. He says that the city will work with the school districts to review ideas and specific plans. The discussion begins with the announcement of an email from a former council staff member who recently left due to the high-cost of SIlicon Valley housing. This is exactly the loss to our community that prompted this forum. 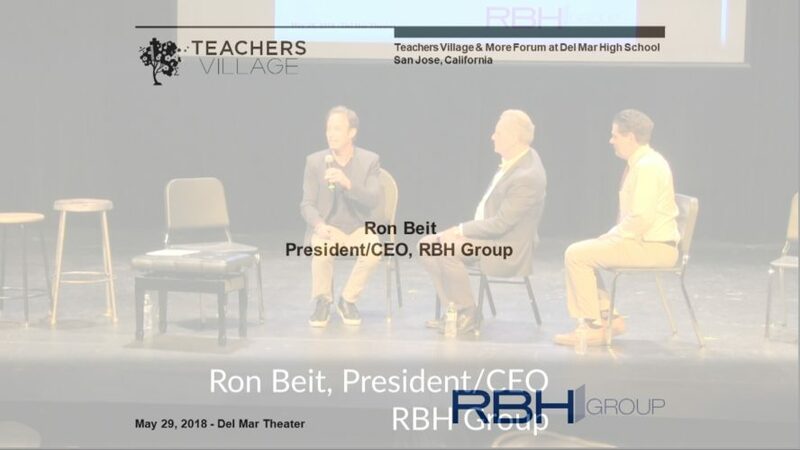 Ron Beit explains that their model is open to all schools and that teachers do not have to live where they teach, although some choose to do so. Echoing what was heard from other speakers, he suggests solutions like what he has put together in Newark work best when a regional approach is taken. That is, there may be teachers from multiple schools mixing. This also provides additional benefits in that the teachers can bounce ideas and learn from each other. He also talks about how they are consciously working with local universities to enrich the experience for all. He also speaks to the opportunities for making capital improvements into the schools at the same time they are building housing and cites a UC Cal Berkeley study suggesting a huge capital and maintenance shortfall for K-12 schools.